In this section you will also learn how the parts we use to make this bracelet could also be used to make an easy pin (brooche) or necklace! With E6000 Glue Or 22g Wire! 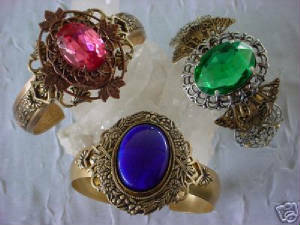 Visit our shop for our rare vintage filigree cuffs shown and illustrated above and at center. No glue is needed! 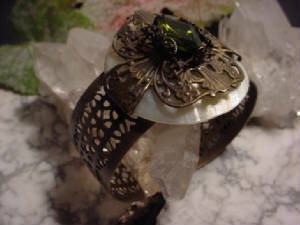 Just "sew" pieces onto the cuff bracelet through the openings in the filigree using 22g wire! It's So Easy To Make Stunning Brooches, Bracelets, Pendants And Earrings With E6000 Glue. When Gluing Small Parts, Squeese A Dab Of Glue Onto A Piece Of Waxed Paper And Use A Toothpick To Pick Up The Amount Of Glue To Place On A Piece. When Gluing On A Pin Back (For Making Brooches), Be Sure To Use Enough Glue So It Seeps Over The Edge. You Can Cover The Glue On The Pinback By Placing A Small Filigree Or Even A Piece Of Leather Over It . GIVE IT A TRY...YOU CAN "GLUE" IT! 1. Select the filigree you are going to use as your centerpiece backing. 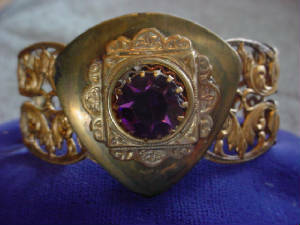 If you are making a bracelet, you will first bend your filigree so it has the same curve as the bracelet. 2. Set all the stones you are going to be using to create your centerpiece design. In this example, a 25X18 Black Diamond facted stone is being used. It is set in the pronged setting so no glue is needed. The two, 10X8 flatback Amethyst stones are set by gluing them into the 10X8 bezel settings. 3. 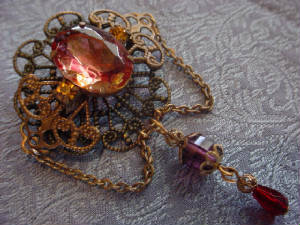 Glue your stones onto the filigree and then glue on any other ornate stampings you have selected. In this example, two small stampings are glued to the top and bottom of the filigree. Note: Before spraying, "mask" your stones with masking tape to protect them from being sprayed. 5. 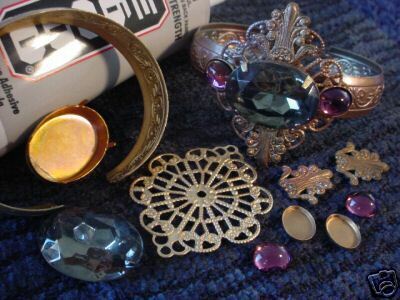 Glue your centerpiece onto a bracelet or glue on a pin back if you are making a brooche. Just Think Of The Different Designs You Can Make By Just Using Different Filigrees And Stones! The filigree and/or the stones in this piece could have been turned lengthwise instead of vertical. You can also dangle beads, chain or charms from the openings along the edges of the filigree, as well as add additional, smaller stones for variety. 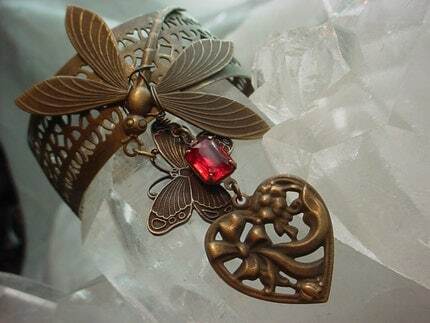 This bracelet is made so easily by just wire wrapping (sewing) the dragonfly onto the openings in the filigree cuff, then attaching charms with jump rings. 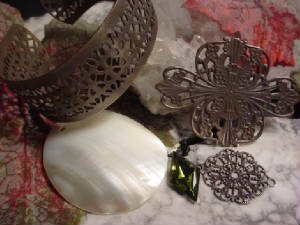 There are just a million and one designs you can create with these vintage filigree cuffs! 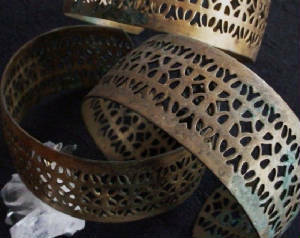 Examples of cuff bracelets combining oxidized brass, antique copper and raw (yellow) brass. This bracelet is made in a snap! 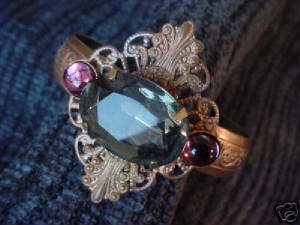 The mother of peart disc was wrapped with the large filigree, and the rhinestone was wrapped with a small lace filigree. The pieces are then just glued (or wire wrapped...sewn) onto the cuff bracelet! 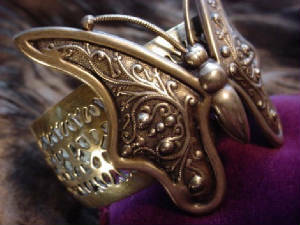 Any exposed glue on the back of the cuff can be covered with a small filigree, brass disc, or even a piece of leather. Bracelets & Brooches Are So Fun & Easy To Make! 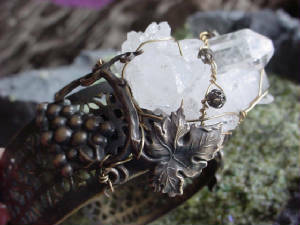 Get Some Filigrees & Stones That You Like And Just Glue It (or wire wrap it)!! I hand polished this bracelet and used E6000 glue to add on an oxidized brass butterfly that I buffed lightly with xfine (#000) steel wool. Note: I also added a brass disk (glue cover) on the back of the bracelet to cover the glue and add extra stability to the butterfly. 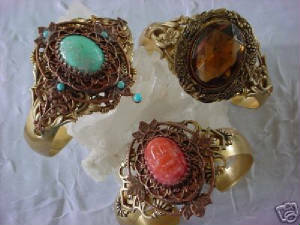 Examples of cuff bracelets combining oxidized brass, antique copper, antique silver and raw (yellow) brass.